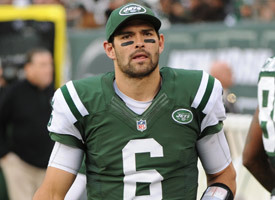 Published: Dec. 6, 2012 at 12:18 p.m.
Rex Ryan's decision to stick with Mark Sanchez at quarterback was met with tepid applause here but jeers throughout the New York area. Jets fans believe Ryan might be putting his job on the line with his choice, but the coach doesn't see it that way. Take a look back at Sanchez's career. "Obviously we need to win," Ryan said Thursday, via the New York Daily News. "This is a big decision. (A big factor) in determining wins and losses is the play of your quarterback a lot of times. But no, I don't feel that my future's tied in with how we do things (with the quarterback)." Ryan knows it's all about the bottom line. "One thing I can (do to) affect the job security is by winning," Ryan said. "That's what everybody wants. Our fans want (it). That's what Woody (Johnson) wants. That's what we all want. Obviously, that's what I want." That's why he's rolling with Sanchez. That's why we can't fault Ryan for his call. The Jets face the Jacksonville Jaguars and Tennessee Titans the next two weeks. Rex won't look so bad if New York can get to, say, eight wins in a season the team was without its two best players, wide receiver Santonio Holmes and cornerback Darrelle Revis. There's no reason to believe Sanchez is the solution long-term, but the same is true for Tim Tebow and Greg McElroy. Ryan is worried about right now. We don't doubt he still believes Sanchez is the superior option.